While Schofield Pass is scenic, for sure, it is, also, tremendously dangerous. Those seeking a scenic drive should continue on Highway 133 over McClure Pass or check out Independence Pass on Highway 82. Forest Road #317, a 4WD only road, follows the South Fork of Crystal River to 10, 720 ft. summit of Schofield Pass. An extremely dangerous road with remnants of wrecks, in the Devil's Punchbowl, for example, to serve as reminders that a single overcorrection could be fatal. Open for bikers and hikers. Subject to closures. Call White River National Forest for updated information at (970) 925-3445. Schofield Pass Road, also known as Crystal Canyon Road or Forest Road #317, begins at the town of Marble. Originally built in the 1880s as a wagon route between Marble and Crested Butte, one cannot emphasize enough how dangerous this road proves to be, time and time again. The rough, one lane shelf road, a roadbed blasted into sheer canyon cliffs, demands high-clearance, four-wheel drive vehicles and a high-tolerance for death-defying, white-knuckled driving. The road begins in Marble and provides a harrowing ride through the mining-turned-ghost-towns of Crystal City, Schofield and Gothic. The drive navigates adventurers through dramatic canyon cliffs with cascading waterfalls and other breathtaking sights. Keep in mind, however, that White River National Forest classifies Schofield Pass as "an extremely dangerous and very narrow road" that is "not recommended." From Aspen, drive 30 miles west on Highway 82 to Carbondale and turn left onto Highway 133. Drive about 28 miles and turn left at signs for Marble. (McClure Pass is 3.4 miles further down the road. If you reach the summit, you have gone too far.) One mile from Marble, the road forks: a left takes you to Lead King Basin and a right (or straight, rather) leads you to Schofield Pass. The road borders Maroon Bells-Snowmass Wilderness and Raggeds Wilderness. Navigable only in the dead of summer and early fall, this road is subject to sporadic closures with rock slides and snowfall not uncommon (even during the warmest times of the year). Contact White River National Forest at the Aspen Ranger District offices (970) 925-3445. Though remarkably dangerous, Crystal Canyon Road is rather popular and highly trafficked by off-road vehicles and ATVs, as well as commercial Jeep tours. 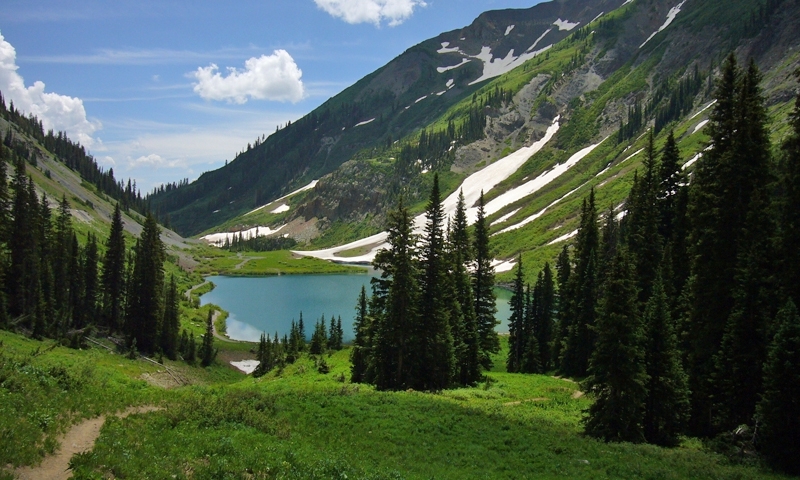 Shorter sections, such as the Crystal City/Lead King Basin loop, offer thrilling adventures, as well as access to historic sites, such as Crystal Mill and Crystal City, without actually summitting the treacherous Schofield Pass. Exploration by foot or mountain bike are recommended alternatives. And, of course, as is the case with all the area rivers and streams, trout fishing in Crystal River should provide excellent returns for anglers. Another great 4x4 climb near Telluride Colorado. Offroad mountain pass near Telluride, Colorado.